From the moment I stepped into Ivy's world of shifters and Pteron in FLIGHT I was a goner. I think it has been my most favorite shifter series ever so far. I loved Levi like no other. But all good things have to end, right? Wrong. Ivy, being the brilliant and oh so crafty author she is, gave us another crack at these wonderful characters...all in a genius spin off series. Could the Empire Chronicles rival the Crescent Chronicles? Oh yes it can and it did. I think I might have enjoyed it more than I did the first series. How is that possible? I don't know, it just is. I am going to be honest with you...SOAR is a love triangle story. I know some of you out there hate that sort of thing. And honestly, I don't know what to tell you. I absolutely loved it. It kept things interesting and you were never sure who Casey would end up with. I am sitting here typing this out and after finishing it the story, after that wild ending, I am still not 100% sure she will stay with who she ends up with. But I am loving what the author is giving us and I will gladly take it. Because however which way you look at it, whoever Casey ends up with is going to be a good pick. Both guys are sweet and endearing…in their own way, of course. Throughout the book we get 3 different POV's: Casey, Toby, and Jared. You all remember Toby and Jared right? Well after being able to get a little closer to Toby, I don't loathe him like I did in the first series. I really do like him. Of course I adore Jared too, but I am just not sure he is the right person for Casey. I think his character is maturing as the story progresses, so he couldn’t be totally wrong for her. But I am still on the fence. I do however think Casey is a great gal and I liked who she is and what she brings to the story. She can be a bit of a character but all in all I liked her. I look forward to what will happen in the next book with her. Something big is about to happen and she is smack dab in the middle of it all. I know when Ivy writes a story I am going to love it. But there is just something about this series (and the spin off) that is so very addicting. I will actually crave it while waiting for more. Almost as if her words are a written spell or a drug of sorts. Absolutely addictive. While reading SOAR, I think enough is explained of the previous series, that you don't necessarily have to read it before this one. But I would absolutely recommend it. It was a fabulous series that you'd be missing out on if you bypass it. So keep that in mind. 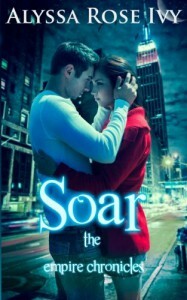 But, yes...I wholeheartedly recommend SOAR to all you NA lovers out there.